MOSCOW, Feb 14 (PRIME) -- Diamond output of Russia’s Severalmaz remained almost flat in 2012 at 559,000 carats, as compared with 558,600 carats in 2011, the company said in a report seen by PRIME Thursday. 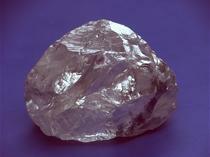 The company’s production guidance for the year amounted to 555,000 carats. Ore mining in this period increased to 1.429 million tonnes from 1.288 million tonnes in 2011, while ore processing rose to 1.066 million tonnes from 964,000 tonnes. Severalmaz, a subsidiary of Russia’s uncut diamond mining giant ALROSA, operates the Lomonosov deposit in the Arkhangelsk Region.